How Supermarkets make us Spend! Smitha - Imagine it's a Saturday afternoon. Many of us are wondering through our local supermarket for our weekly shop, unaware of just how many messages we are unknowingly taking in as we choose what goes in our basket. To unveil some of these hidden messages, I've come along to a large supermarket here in Cambridge and joining me is expert in consumer psychology Philip Graves. Straightaway, I can see a huge red sign with a special offer for wine. Philip - Yeah, this is quite unusual. What most supermarkets do is introduce you to the fresh products straightaway. But here, they've gone a different way and what they're doing is they're presenting us with a lot of offers. What that does is it attracts you in, it draws you in, we're used to that big red sign, the big price point, and that's a quick way of buying. So rather than spending all that time, looking at this big confusing selection where if you don't know much about wine, you could spend all day. Here, they're giving you an easy decision to make. This is "obviously a good deal" because it's got a big red price. Smitha - I don't know very much about wine and I always think, "Oh look! That's a £10 bottle marked down for £5" and I got it thinking, it's definitely a good wine. But is that always the case? Philip - In neurological studies, what they found is if you give people the same wine, but tell them it's more expensive, they actually experience it as being better at a brain level. The reward centres of the brain light up when the price is higher. So, the reality is, you will enjoy it more if you believe that what you got is a £10 bottle of wine but you've only paid £5 for it. Smitha - We ventured a little bit further into the shop now. We're actually yet to come near any groceries as such, but you've stopped. What's caught your eye? Philip - Well I'm looking here at this very heavily discounted product, an anti-wrinkle cream. This is all part of giving us the feeling that there are great deals more widely and that the total shopping experience is inexpensive. Now, I did a little bit of checking before we came. This product is genuinely half price. Conversely, if you were going to buy your dishwasher tablets here, they would cost you slightly more than twice as much as they would in the other supermarket. So, what's happening is, they're winning on some and losing on others, but the impression that we pick up, because of the way our minds work, is to select those deals and attribute them to the store we're in. And if that's something we're buying, we tend to think that other things are cheap as well because of those great headline grabbing deals that we encounter. Smitha - So you get an overall impression that this is a really good place to shop. Philip - That's right because if you think about it, all the big deals - the big discounts, this feels fantastic. So there's a huge emotional impact to the brain level from that product, but the mundane products your buying that are ordinary every day things that are at the standard price don't have the same impact. So you have what's known as an availability heuristic. This looms large in your mind where the other things don't and as a result of that, we tend to misattribute later on the general feeling of competitive pricing because of the one or two examples that we find that we feel great about. Smitha - And I guess the other factor to take into account is, I don't often walk around with a bunch of prices or price comparisons printed out. I'm not often 100% sure of what the most competitive price of an every day product is. Philip - Absolutely right. You know, we rely on these general themes, these general ideas, these heuristics we have about whether or not we're making good decisions or not, but they're nothing to do with the fact because they're too complicated to get access to, they're too difficult and too time consuming to reference. So, we create these shortcuts in our mind and sometimes they work for us, but sometimes they're open to a little bit of manipulation, exploitation. Smitha - Around the corner, at last there is some food. Philip - That's right. We're now into the food part of the experience and they have primed us with the fresh produce. So we've got fresh fruit and vegetables, flowers on one side and fresh meat on another. So this is setting us up to think this is a place that sells fresh food. Even though probably over 50% of the products in here are going to be ambient, long storage products. Smitha - Spinning around now, there's loads and loads of really colourful juice cartons with big signs, with "Buy 4 for £3!" What's going on here? Philip - You've got those big prices again which back at the beginning of the store, people were primed to look out for. My guess is that a lot of the people who are buying the juices from that display won't know what the individual price of those cartons is, but in a sense nor will they care because they're taking the shortcut that's saying, "This is obviously a good price because it's a big red price." So they're using the priming they've set you up with, they're carrying it through and they're cashing in on the fact that you probably won't scrutinise how much of an effective deal that is. Smitha - I've just seen a lady put a big bag of 24 toilet tissues into her trolley, so is buying in bulk a good idea? Philip - Again, we use these shortcuts. 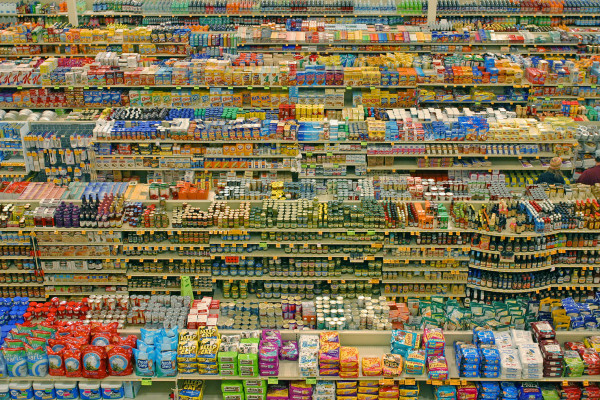 Shopping in a supermarket isn't about consciously evaluating all the time. If you did that, I would think your total shop would probably take you a day. If you really wanted to price check, look at the cost per gram, it's just not practical. It's not the way it would work and it's not the way our brains are designed to work either. We work on these heuristics, these shortcuts that generally work for us, but they don't always. We've got an example here. You buy the biggest pack of, in this case, the own brand luxury toilet roll, 24 rolls and that's going to work out at 15.9 pence per 100 sheets, I think that says there. But as we move here, we can see that if you just buy a simple pack of 4, it's actually 15.6 pence per 100 sheets. So, it's going to be cheaper to buy that product, 6 of those instead of one pack of that, but then even then it's fiddly. You've got to do all the extra looking around, but we'll go for convenience, we'll go for the shortcut that tells us this is the cheapest way to buy and you're starting to see those links now between those primes they're creating with the big red prices that say, "This is discount. This is cheap. You're being clever buying this way." And the reality, in this case, is actually it's not the smartest way to purchase. Smitha - I don't think shopping's ever going to be the same. It must be pretty exhausting for you? Philip - I have to say it's not a whole lot of pleasure and there is a limit to how far you really want to take these things as a consumer because once you start to see the shopping experience as, in a sense, a game of psychological manipulation and a battle of influence, it's not really as much fun as it used to be. there is a longer version of that very nice interview. Previous Why does celebrity sell?